By 2012, Pebble had completed one million feet of exploratory digging and opposition to the project was in full swing. Fishermen, Alaskan Native groups, and political allies launched awareness campaigns and lobbied for state and federal action. In 2014 the EPA stepped in, releasing a scathing scientific assessment of the impacts that a large mine could have on the region and proposing a number of restrictions to the Pebble project. Anglo American pulled out of the partnership (after investing $573 million in the project), and Northern Dynasty’s stock fell from a high of over $20 a low of $0.21. The battle seemed over. The mining project, which had been stalled for the past three years, is now gearing up to apply for the state and federal permits it needs to begin construction. Northern Dynasty is also shopping around for a partner, as it needs $150 million for the permitting process alone (and a billion or two for the development of the mine). This might seem like a hefty sum, but given that the mineral strike is potentially worth hundreds of billions, Northern Dynasty is confident they’ll find a partner by the end of the year. The company recently released a timetable of “project milestones” which aims to finish the permitting phase and begin construction within the four years of Trump’s first term. As we did a final loop over the proposed site of the mine, Halford explained that one of the largest concerns with the Pebble project is the sheer scale of it. Northern Dynasty hasn’t put forward a formal mining plan, but given how far away the mine site is to any transportation hub (about 85 miles), and given the low-grade nature of the deposit (meaning that there’s a lot of other stuff in the ground that isn’t gold or copper), any economically viable mine would have to be huge. Exactly how huge can be a bit hard to fathom: the EPA report posits that the mine pit could be as deep as the Grand Canyon, and the entire mine footprint (which includes the pit, and waste containment facilities) could cover an area larger than Manhattan; other estimates suggest that the Pebble Mine would be large enough to comfortably hold every other mine in the state. If not the biggest, the mine would likely be one of the largest open-pit gold and copper mines in the world. For Halford, who’s used to seeing this landscape from the air, the scale of the mine is easy to understand: “Just imagine that, upside down, that’s the size of the pit they want to make,” said Halford, pointing to a mountain in the distance. To be fair, Northern Dynasty hasn’t yet released a formal mine plan, and the company recently a press release stating that they’ll be “advancing planning for a smaller project design at Pebble than previously considered, and one that incorporates significant environmental safeguards.” But, for the time being, the company isn’t able to share any specifics. And regardless of how big or small, any mine would necessitate the construction of roughly 85 miles of roads, pipelines, a power plant of sorts, and potentially a shipping port. Also, Pebble isn’t the only potential mine in the region; there are a dozen or so other claims in the same watershed. 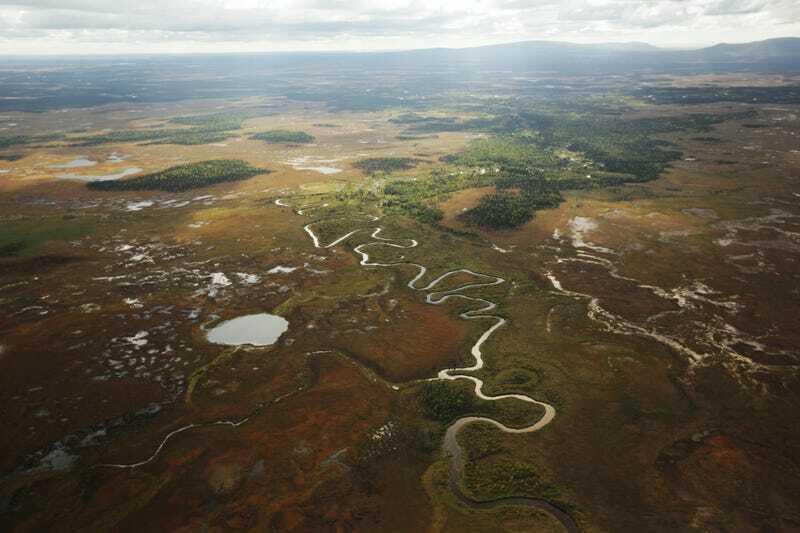 If Northern Dynasty were to foot the bill for the transportation corridor, other smaller projects could suddenly become economically viable, potentially turning this portion of the Bristol Bay watershed from fish habitat into a mining district. There’s also the issue of what to do with all the stuff in the ground that isn’t valuable, which, in the case of Pebble, would contain sulfur, traces of copper and other materials that could have negative implications for salmon habitat if released. Open-pit mines typically contain their byproducts in large dam systems, which have been known to leak or fail. This is precisely what happened at the Mount Polly gold mine in 2014, where a dam failure unleashed about 4.5 billion gallons of water and toxic debris into the surrounding salmon habitat. Turning away from the mine site, Halford flew due west towards Wood-Tikchik State Park: 1.6 million acres of remote rivers and lake systems. He followed the waterways; slow moving snakes, extending out forever. “The beauty of flying is that you get to see how everything connects,” exclaimed Halford. “And in this part of Alaska, the connection is water.” Far in the blue distance, the shadow of mountains emerged, teeth coming out of the earth. Halford picked a line between two peaks, flying close enough to a cliff that I could make out the individual rocks. Then, suddenly, the air in front of us opened into the Tikchik lake system: 12 massive alpine pools spread over 1,000 acres, the breeding ground for millions of salmon. The first thing that the lead scientist at the world’s longest running salmon research camp did as we stepped off the plane was offer us a beer. The second thing Daniel Schindler did was boat us across Lake Nerka to Little Togiak River, to see the fish: tens of thousands of salmon congregated in the river, waiting to mate. These were the lucky ones, Schindler explained, they’d survived years in the ocean, swam past an onslaught of fishermen, hungry grizzlies and swooping eagles, had likely not eaten for a few months, and now were within a few hundred meters of where they were born. Normally silver, the salmon had turned a striking red to attract a mate, and the males had grown elongated snouts and teeth, to fight off rivals. In a few weeks, all of these fish would be dead, but in their wake millions of eggs would hatch an entire new generation of salmon. Schindler laughed at the look of amazement on my face: this is nothing, he said, just wait till tomorrow, I’ll show you a real force of nature. That evening Schindler cooked up a meal of pasta and Bolognese sauce, and, just as the sun was setting, two graduate students returned from the field. After dinner and during a few glasses of beer and boxed wine, Schindler got to the heart of the Pebble Mine issue: water. The very same thing that makes Bristol Bay such a good place for salmon is what makes a mine like Pebble so dangerous. The last glaciation carved up Bristol Bay’s landscape, leaving a layer of gravel that makes the land a giant colander: snow and rainfall seep through the ground, and eventually percolate back out onto the streams and rivers; this water flow oxygenates the salmon eggs and keeps them from freezing, and the gravel gives salmon fry plenty of places to hide during the first months of their lives. But the porous landscape also means that any runoff, spillage and dam failure from a mine would be very difficult to contain. Copper leaking out into the waterways would interfere with salmon’s sense of smell, which is a critical component of finding their way back to their natal streams to spawn. And if sulfur leaked out, it would combine with the air and water to form sulfuric acid. “Battery acid,” said Schindler, flatly. The next morning Schindler and a graduate student zipped us across the lake to the Agulukpak River. Schindler turned the boat engine off, letting us drift towards shore. I stood up to get a better look into the sun-drenched river, catching a fish here and there. Then, all around, red specs began to appear, gems gleaming in the clear water: salmon everywhere, in twos and threes, waiting to mate. Schindler looked over at us, smug: in these few miles of river, Schindler estimated that there were 500,000 fish. 300 years ago, the waters all along the American coast, both Pacific and Atlantic, teemed with salmon: hundreds of millions of fish, perhaps even billions of fish. You could practically have walked from England to the Americas on a silver bridge of salmon. Things changed quickly. As we built settlements along waterways, dammed and shifted rivers, and deforested riverbanks, we systematically eliminated the breeding grounds for Atlantic salmon. By the 1800s, nearly every strain of Atlantic salmon that inhabited the rivers of North America had disappeared. Pacific salmon fared only slightly better; development locked off lakes and rivers, wiping off countless strains of salmon. In California, Oregon, Washington, and Idaho, salmon are believed to be extinct in 40 percent of the rivers where they once existed and highly diminished in the runs that remain. The lesson was clear: unmeasured development can destroy a population that was once hundreds of millions strong. “People have made assumptions about the impacts of our project, without having a project to base those assumptions around,” said Mike Heatwole, Vice President of Public Affairs for the Pebble Mine. “The EPA report was an outcome looking for a study, they went into it looking for a way to stop this project, and that’s not how the system is supposed to work.” We were sitting in his office in Anchorage, which was littered with research papers and pro-Pebble stickers. Heatwole has a long, tired face, you can tell that he’s answered all of these questions hundreds, if not thousands of times. For every mine disaster, Heatwole can list off a dozen mines that are examples of successful development; in Alaska alone, he quickly cited the examples of Red Dog, Fort Knox, Greens Creek, Kensington and Pogo. The obvious answer here is yes. But there is a big “but” hidden in there: The Alaska Department of Natural Resources (DNR), rarely, if ever, denies mining permits. Several people, including Halford, told me that DNR had never rejected a mining application, ever; when I reached out to DNR to get a final word on this, an agency spokesman told me that he’d “have to research this question a bit more to provide specific examples,” but that generally denials are rare, because DNR will allow applicants to rework their application until it complies “with existing state laws.” So, if you don’t trust the permitting process in the first place, then there’s good reason to want the EPA to step in like it did. Now that the EPA’s proposed restrictions are in the process of being removed (a 90-day public comment period on the withdrawal of the proposed regulations ends October 17th), the next step for Pebble to get the state and federal permits it needs is to publish a formal mine plan. Heatwole said that such a plan would be released within the next few months, and although he wasn’t able to share the details of the forthcoming mining plan, he did verify that it would be for a “smaller project design” than previously considered. If everything goes according to planned - Northern Dynasty gets a partner in the project to help with financing, and obtains all the permitting flawlessly- the construction of the mine could start by 2020. Throughout our interview, Heatwole bemoaned the bad press that the project had received since its inception, explaining at length how Pebble Mine would be good for the region: generating around 15,000 jobs, bringing in tens of billions in tax revenue, and, if properly built, having only a limited impact on the region’s fisheries. “And, to top it off, we need copper,” said Heatwole. In defending Pebble, Heatwole likes to use an argument first put forth by two Yale University Professors; the central tenants of the Consumption Conundrum are fairly simple: as a society, we use an enormous amount of mined material (copper, for instance, is a critical component for nearly all electronics), and we have an obligation of choosing where and how these minerals are mined. “The U.S. has some of the most stringent environmental laws in the world,” Heatwole explained. “And so, the question is: do you want to develop a mine under these standards, or do you want to turn a blind eye and have the minerals mined in third world jurisdictions where the environmental restrictions are probably not close to what they are here?” Heatwole’s point is reinforced when you look at some of the larger copper producing nations (Chile, Peru, China and the Congo), all of which which have shoddy mining track records. Moreover, the U.S. imports about 35 percent of the copper it consumes every year, the bulk of it from Chile. There’s no doubt that a mine the size of Pebble, with potentially 81 billion pounds of copper, would significantly reduce U.S. copper imports. Hurley told me that most of the Native Alaskans represented by UTBB view Pebble Mine as a threat: a survey conducted in 2009 showed that as high as 80 percent of the adults in the Bristol Bay area opposed the mining project, and almost 90 percent believed that the mine posed a risk to the fishery. Robert Heyano, president of UTBB and livelong fishermen of Bristol Bay, explained the reason for these strong views: salmon aren’t just food or money, but cultural identity. A huge part of UTBB’s missions is ensuring that the native people of Bristol Bay reap the benefits of the resources in the area, most notably fishing. Hurley explained that this entails keeping a mine like Pebble out, but there’s more to it than that. Overtime, Native Alaskans have slowly been pushed out of the commercial fishery: when permits were first issued in 1972, almost 40 percent were held by local residents (the majority of whom were Native Alaskans), now that number is less than 20 percent. By contrast, 55 percent of the permits are currently held by out-of-state residents. UTBB, in collaboration with other regional organizations, works to get these permits back into native hands. Heatwole had mentioned to me that Iliamna wasn’t the only village in the region that viewed Pebble as a potential opportunity. “In Pebble, we want to protect the fish, protect the water, and create the opportunity for local people to have jobs,” he told me, explaining that Northern Dynasty has consistently made community involvement a cornerstone of their development program.